The iconic Monopoly iron game piece is displayed in 2013. Last week, I dove into the data and design of Twilight Struggle — the best board game on the planet, according to the popular gaming site BoardGameGeek. I spoke with game’s designer, and tapped into a vast games database, to uncover what makes a game truly great. But enough of that. How about the worst games ever made? This question is a bit tricky. When we say “worst” — worst song, worst book, worst game — we usually consider factors other than just quality. It has to be a product with a certain amount of exposure in addition to being awful — a flop. That’s why the “worst” movie ever made is more likely to be considered “Gigli” than that awful student film I made in college.1 What we’re after are the terrible games that a significant number of people have played. Here, as I did before, I’ll rely on the vast board game database maintained by BoardGameGeek.2 Using this data, let’s take a closer look at the bottom of the heap. 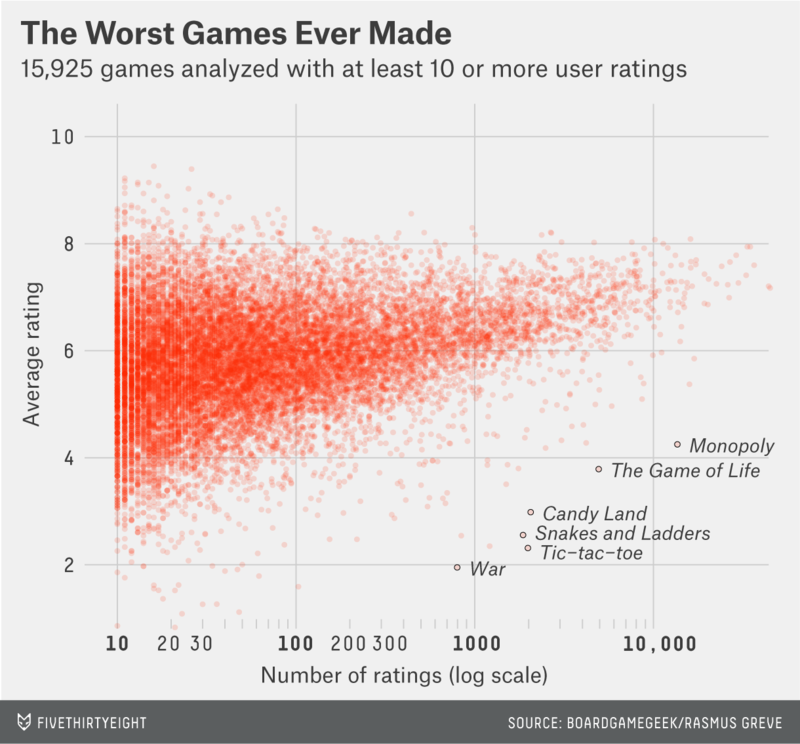 The chart below shows all the games in BoardGameGeek’s database with at least 10 user ratings — a collection of more than 15,000. 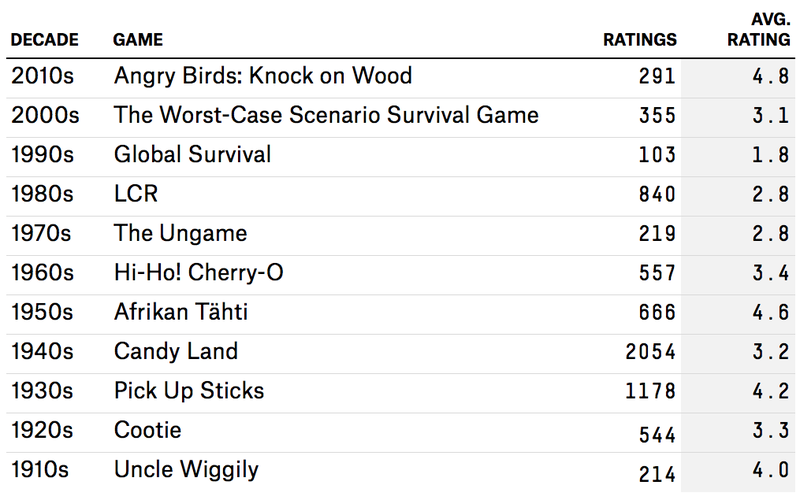 Users rate games on a scale from 1 (“Defies description of a game. You won’t catch me dead playing this. Clearly broken.”) to 10 (“Outstanding. Always want to play, expect this will never change.”). Despite the site’s name, the database includes not just board games, but card games and pencil-and-paper games such as tic-tac-toe as well. For your convenience, and the good of the world, I’ve labeled the outstandingly terrible games. BoardGameGeek gives official rankings down to 10,505th place, as of this writing. The holder of that dubious spot: tic-tac-toe. Tic-tac-toe has no luck, but playing the game is purely academic. The skill required is trivial. It’s a solved game — if both players are above the age of roughly 5, the game ends in a draw. The one game in the hall of shame that requires a modicum of skill is Monopoly. There are even Monopoly tournaments. You have to decide whether to buy properties you land on, how to bid if a property is auctioned off, and how to effectively make trades. Seems reasonable. But stories behind the worst of a genre can also be complicated and unexpected. And, probably due in large part to its huge popularity, Monopoly has become a bête noire for many serious board gamers. It suffers from problems that most game designers nowadays try to avoid. First, players can be eliminated. This is no fun — unless, of course, the eliminated player finds something better to do than play Monopoly — and games are meant to be fun. Second, there is often a runaway leader. Someone can snap up a juicy monopoly early on, and that quickly becomes that. The rest of the game is pro forma and boring. And games aren’t meant to be boring. Third, there is what’s known to game designers as a kingmaking problem. A losing player can often choose, typically via a lopsided trade of properties, who wins the game. This is also no fun and negates whatever skill was required to begin with. But there is a tension here. These games are rated as objectively bad, but they’re widely played and will no doubt continue to be. Why is that? First, there’s a selection bias. The users of BoardGameGeek — the source of my data — are mainly serious (and adult) gamers. And they prefer serious games. Candy Land doesn’t fit that bill. Also, these “bad” games are cultural touchstones. Through whatever quirks of history, culture and commerce, these are our first games. I — and I can’t imagine I’m alone — retain fond memories of playing Candy Land with my cousins during summers at my grandma’s house and War with my friends on the school bus. Monopoly and The Game of Life may bespeak a special American capitalist fascination — an ingrained desire to live out a make-it-or-break-it adventure. I argued in my earlier piece that we are living in a golden age of board games. But I was also curious about the real stinkers throughout the ages, including some more recent ones. (Here, let’s just consider those games with at least 100 ratings.) This table shows the worst games by decade. The Ungame. Let’s unplay it. CORRECTION (Jan. 21, 11:46 a.m.): An earlier version of this article misspelled Uncle Wiggily. No, I will not provide a link to that awful student film I made in college. Also as before, specifically I use data mined from the site by Rasmus Greve. You can find more on his board game data project in this paper. In unscientific polls I conducted at local public houses this week, War emerged as the consensus loser among my cohort. This is verified by the data.